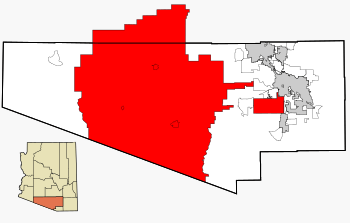 Map shows the location of the majority of the Tohono O'odham Nation in Pima County, highlighting the large Tohono O'odham Reservation as well as the smaller San Xavier Reservation in red. The non-contiguous segments in Maricopa and Pinal counties are not shown. The Tohono O'odham Indian Reservation, is located in southwestern and central Arizona, United States. The reservation is the homeland of the Tohono O'odham ('Desert People'), an indigenous North American people who reside primarily in the Sonoran Desert of southern Arizona and the Mexican state of Sonora. The reservation had a total 2000 census population of 10,787. The reservation is located at . It has a land area of 11,243.098 square kilometres (4,340.984 sq mi) (97.48 percent of the Tohono O'odham Nation total area), and a 2000 census population of 8,376 persons (77.65% of the total). It encompasses portions of central Pima, southwestern Pinal, and southeastern Maricopa Counties. The land is also site of the Quinlan and Baboquivari Mountains, which include Kitt Peak, and the Kitt Peak National Observatory and telescopes, as well as Baboquivari Peak. These astronomical sites are under lease from the Tohono O'odham Nation. The lease was approved by the council in the 1950s, for a one-time payment of US$25,000 plus $10 per acre per year. Tohono O'odham Indian Reservation Facts for Kids. Kiddle Encyclopedia.